Bill's OBX Beach Life: The Wavesailing Experience, Which Would You Prefer? The Wavesailing Experience, Which Would You Prefer? Discussion arose last night at the Avon Sailhouse Spring season closure dinner party about the wavesailing experience and "convenience" vs. "the search/safari" I remember reading about a similar topic on the OffTheLip.us website (is that site still around?) last year where discussion arose about running wavesailing contests and whether its better to run events around spectator convenience or wind/wave conditions. Convenience is important for high spectator numbers, and even participant ease of "finding" the event; however, should conditions be sacrificed to satisfy convenience? Its an interesting debate, and especially relevant here on the Outer Banks given that our wave spots are not static and sandbar setups change year to year, season to season, even week to week. We do have convenience in locations such as Ego Beach (directly across from Canadian Hole) and Old Hatteras Lighthouse beach. At times these locations offer excellent conditions; however, many times they do not, and other spots around the islands offer wind and surf which satisfy the pallet of both the diehard and aspiring wavesailor. Some spots are easily accessible yet require some mileage relative to Canadian Hole, while others require 4WD capability. However, if a prime wind/wave setup is found outside the convenient locations, is it worth making the effort to hit it?! I prefer the "search" aspect of going off road. Its like the line in The Windsurfing Movie.."if you always stay at the same spot, you'll never find out what your missing". So much of what i learned during wave fest last fall is that so much of what Hatteras has to offer is off the beaten path. sure the planets may align and provide a good sandbar right at ego, but what are the odds? Heck, during wavefest last year, we had super strong NNE wind for almost a week, making the east facing beaches pretty much unsailable other then the survival sort. but just around the bend, it was entirely epic with managable shorebreak. Before wavefest, i'd just baff at the hole. Just look at the jammer sesh a few weeks ago. I almost broke all my stuff launching at ego. Massive shorebreak (as your rotating header will attest! ), yet just up at ramp 27, we scored just a magical session! You simply open up so much more potential and increase the probabilty of scoring an epic sesh if you simply avoid limiting youself, and searching. to say nothing of the optimal wind direction and taking advantage of the unique shape of the obx which means you can pretty much find a side off beach somewhere, you just gotta go search! nah, give me my 4x4, and some wind in ANY direction, and I can score just about every time in Hatteras. The Windsurfing Movie.."if you always stay at the same spot, you'll never find out what your missing"
Found a New Wave Spot! 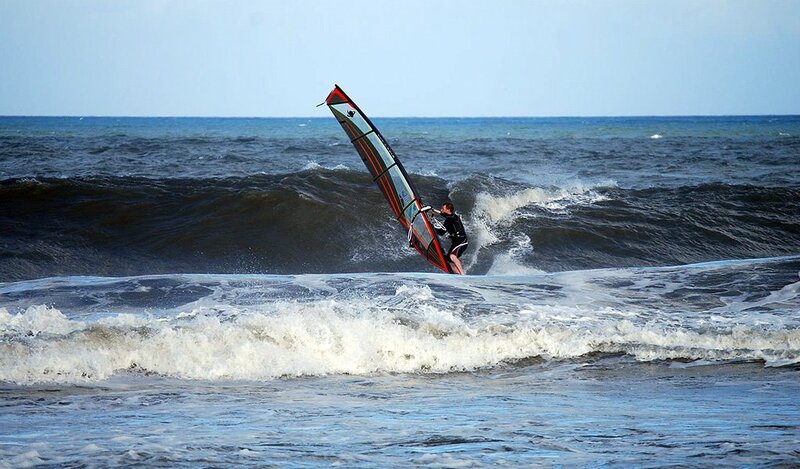 Wavesailing at the Washout AGAIN! !